I am so happy to post this recipe today ! My follower Hitesh Chandani won some of my lovely saffron in a giveway therought http://www.masalaminds.com. 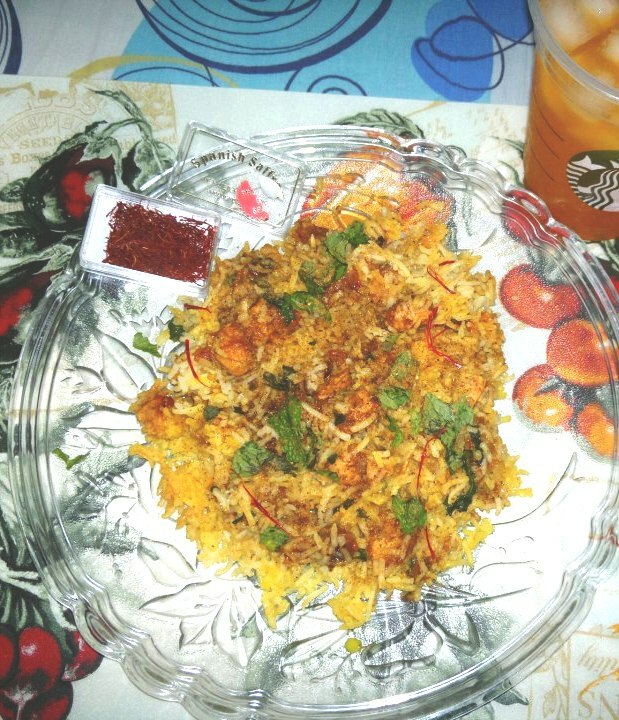 He made this chicken biryani and was kind enough to send me the pic and the recipe. I know how many of you just love a good biryani so here is an excellent recipe. Boneless Chicken breasts – 250 gms. Rice parboiled. mixed with a bit of yellow color. In a pressure cooker, put some oil and saute the Chopped onions and Green Chillies till with ginger garlic paste, till they are brown. Then add the boneless chicken and chopped tomatoes and keep stirring for about 5 minutes. Add Salt , 3 tsp red chilli powder, 1 tsp coriander seed powder, 3-4 tsp Chicken masala 2 tsp Old Bay Meat Seasoning, 1tsp pinchito masala. and the Yogurt and mix it very well. Remove the lid and let it dry for about 2 minutes. Now in a deep pan, start layering for the Biryani. Grease the bottom with oil. and make layers (i made two layers) with Rice > Chicken > Biryani masala > Sugar > Chopped coriander and Mint leaves > and Milk mixed with Nitu didi Saffron. and Cover it with lid with a low flame on. Then within 5 minutes the Biryani is ready to serve. You can also make it without the pressure cooker. Just follow the steps but add a little water so the chicken cooks. Crocin, Safranal and Picrocrocin from saffron may be involved in anti-cancer activity by inhibiting the growth of human cancer cells. Saffron tea has been used to treat depression. Ingesting large amounts of the tea and spice has been reported to cause feelings of happiness and joy. This entry was posted in Chicken, Gluten Free, Ideas for meals, Indian Restaurant Dishes, Rice is Nice, Saffron and tagged biryani, chicken, desi recipes, restaurant recipes, rice, saffron. Bookmark the permalink. Thanks to Nitu didi for such aromatic original pure Saffron…. You guys should definitely try. Biriyani looks super delicious and flavourful !!! Thank you Masalaminds… and Thanx Shobha ij,,, Surely do try.. and Congrats too !